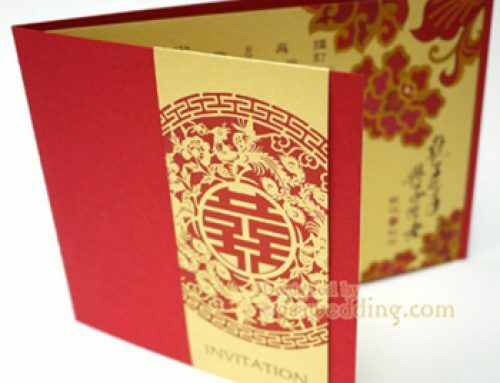 In the season of spring, we would like to design more invitations with the element of blossom flowers and dancing butterflies. We always think spring is a charming season because everything will show their energetic side. Lovers will also be united in love and exchange the marriage vows in front of friends and relatives in this season. 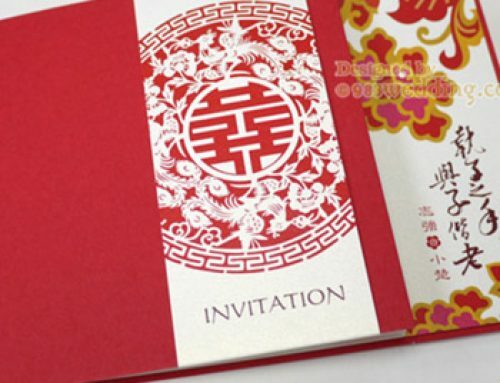 So, let us take a look at this Spring wedding invitation. 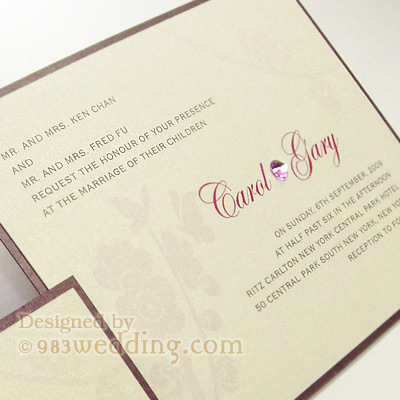 The main colors of this wedding card are royal purple and pearl color. 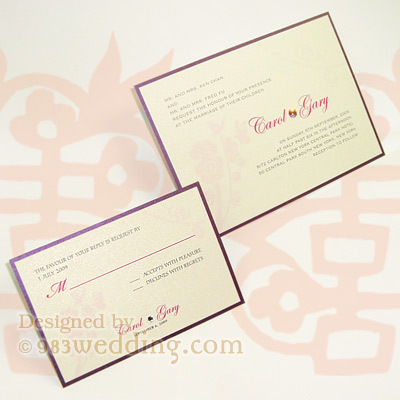 The front of the card is a piece of pearlized color paper. 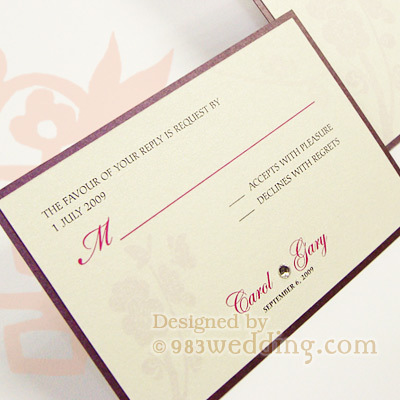 The information of your wedding will be printed on this piece of card. It is in turn mounted on another piece of royal purple paper, which is slightly bigger than the pearlized color counterpart. Due to the small difference in sizes, a purple color border will be seen at the front of the card. A border created in this way will make the design look unique and more 3-dimensional. This also explains why we do not print a border on the card instead. Patterns of butterflies and cherry blossom will be printed on the front. 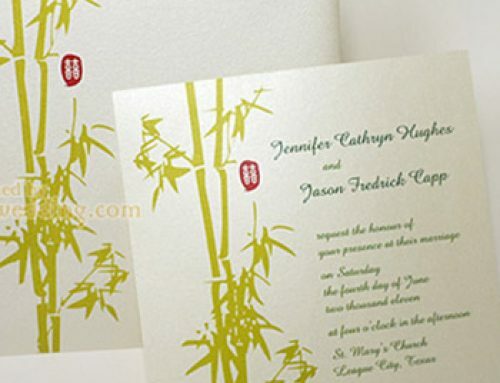 Yes, these patterns are certainly for your Spring wedding. The color of it is a very light pink color. This creates a very subtle pattern on the card front. You will still have to print the wording. As a result, it will be a good idea to have a more subtle pattern along with the wording. The names of the couple will appear on the right-hand side of the pattern. It is in red color. 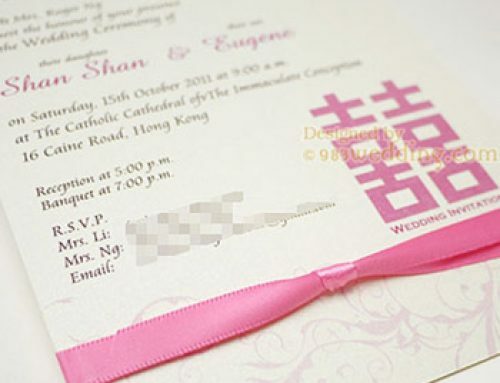 Usually, there will be the symbol “&” between the names of the bride and groom. The treatment is a bit different here. A piece of rhinestone is used instead of putting the symbol “&” between the names. With the bling-bling effect, this rhinestone will draw the attention of the guests who receive your wedding invitations. Besides the invitation, other items such as R.S.V.P. 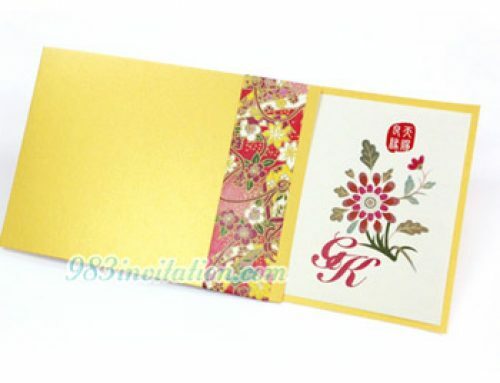 card and thank you card of the same design can also be ordered with this beautiful invitation. 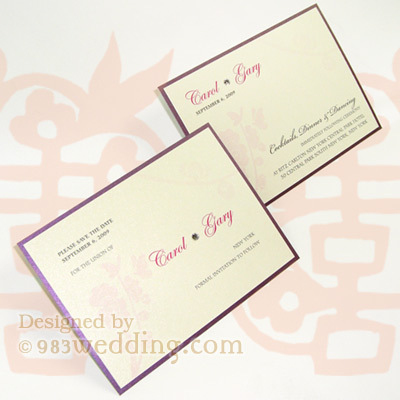 Purple color pearlized card mounts on 300gsm TP creamy pearlized paper with full-color printing on ONE side. One purple color crystal is glued to the card front.